Professor Trócsányi has been appointed Minister of Justice of Hungary in 2014, which position he still holds at the time of publication. Prof. Dr. László Trócsányi is a professor of constitutional law at the University of Szeged, Hungary, who served as an ambassador to Paris, France (2010–2014). He previously sat on the bench of the Constitutional Court of Hungary (2007–2010) and was involved in the activity of the Venice Commission of the Council of Europe (2005–2013) as the substitute member for Hungary. After 2000, he served as an ambassador to Belgium and Luxembourg (until 2004). Trócsányi is also the founder and a partner of Nagy & Trócsányi (currently suspending his partnership, since 2007.) 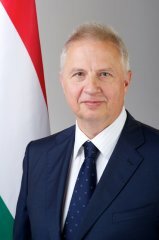 Professor Trócsányi has been appointed Minister of Justice of Hungary in 2014, which position he still holds at the time of publication.